When folks complain regarding gaining excess weight, it’s largely as a results of very little things that mix along and result in fat gain. 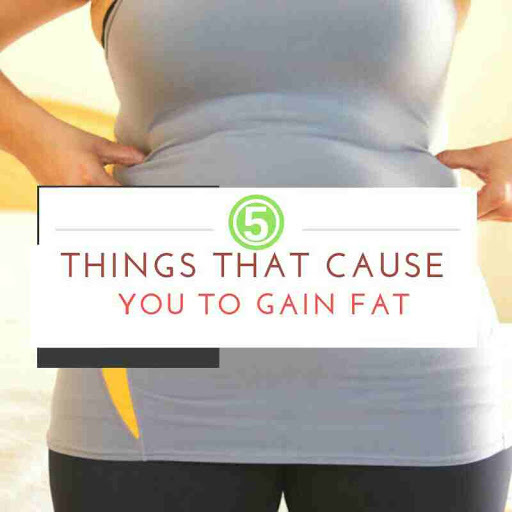 Here are 5 things that cause you to gain fat. Eating your meals quickly or in a hurry can cause you to gain fat. This is because it takes your body up to 20 minutes to tell your brain that you’re full. Eating your meals in a hurry can result in you eating excess food, resulting in you becoming overweight and obese. Not drinking enough water regularly can also lead to unnecessary weight gain.Thirst is often mistaken as hunger or food cravings, causing you to eat while trying to quench this “hunger”. If you’re ever feeling hungry, try drinking a cup of water and waiting a while to see if the hunger remains or goes. While a social life plays a part in your overall well being, it may also be the cause of your unhealthy weight gain. Social events and situations often involve unhealthy fast food and alcohol which add unneeded calories to your diet. If you also have friends who eat a lot, you may find yourself mirroring them and consequently eating a lot too. Lack of sleep is connected to unhealthy weight gain because of hormonal changes and fatigue. People who do not get enough sleep at night have a higher risk of developing belly fat. This then increases their risk of chronic diseases like heart disease and diabetes. People who spend a whole lot of their time sitting down are more likely to be overweight. This also comes with an increased risk of developing chronic diseases. This is because they spend a lot of their time sitting down instead of being engaged in physical activity which is beneficial for their health.